Boral unveils revolutionary Forward Moving Aggregate Spreader (FMAS). 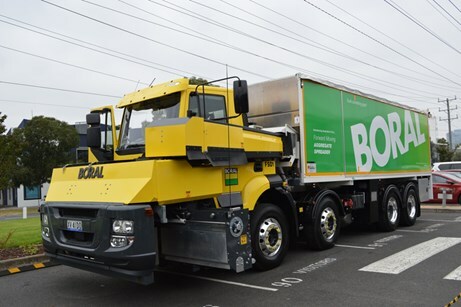 Boral Limited today revealed a new road surfacing truck to make the task safer for workers, increase product quality and help to reduce infrastructure costs to road agencies. The new Boral Forward Moving Aggregate Spreader (FMAS) streamlines the spray seal road construction method, greatly improving safety and productivity. Until now, the process involved road crews working with reversing trucks that applied the aggregate through an elevated tipper body, increasing the safety risks to workers. The Boral FMAS disperses aggregate from the front of the truck via a conveyor belt and spreader box. The design has resulted in quicker completion of works, and significantly reduced any potential infrastructure and overhead damage such as contacting power lines, trees and bridges. Stuart Partridge, Boral’s National Asset Manager – Asphalt, says Boral designed and developed a Forward Moving Aggregate Spreader following a call to industry by the Victorian roads authority – VicRoads – as a result of a serious accident involving a VicRoads worker some years ago. 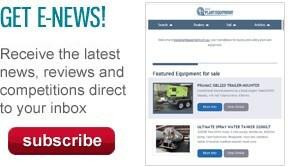 "This invention allows locally manufactured and approved trucks to be substantially modified while still meeting regulatory standards, which is why VicRoads has mandated that forward moving aggregate spreaders should be in use on all its projects by 2022 – a move we hope will be followed by other State road authorities nationally".